Microdermabrasion rejuvenates and revitalizes your skin in just an afternoon! Microdermabrasion uses a fine jet of crystals to gently exfoliate your skin while vacuum suction removes the crystals along with the dead skin cells. You are left with new, softer skin and a more even skin texture. This simple, quick and convenient procedure has become very popular with patients showing the early signs of aging, sun exposure and other facial imperfections. Non-invasive and non-wounding to the skin’s surface, the procedure entails no down time or recovery. Patients typically experience some redness for about an hour after the procedure and make-up can be applied immediately. Microdermabrasion is not to be confused with dermabrasion which has significant down time in recovery. 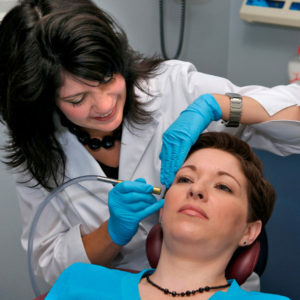 Patients typically experience some redness for about an hour after the procedure. This results in no down time so a person can return to work and resume all normal activities immediately. Make-up can also be applied immediately. Contact our office to book your microdermabrasion. Let our professional staff offer you the care and experience you deserve.